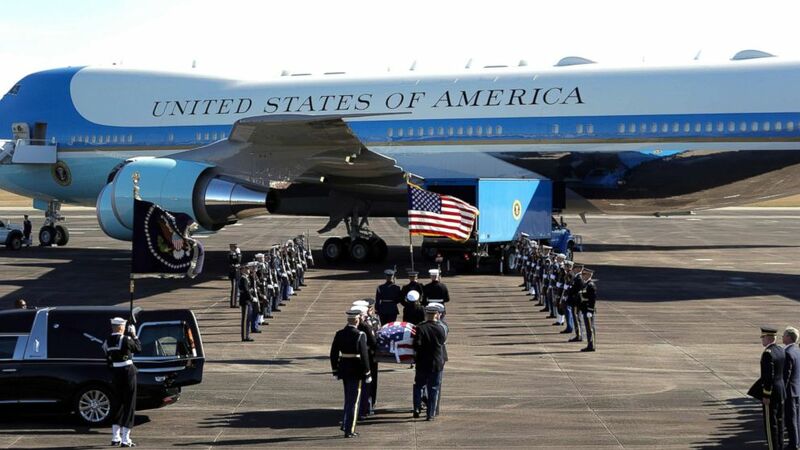 After a funeral ceremony in Washington, the former president returns to Texas. After "Hail to Chief" and a 21-gun salute rang out, the casket of President George H.W. Bush was carried up the steps of the U.S. Capitol as the setting sun cast a pastel sky over Washington in a final nod to one of America's great public servants. The late president's son, former President George W. Bush, held his hand over his heart and held back tears as he watched pallbearers carry his father into the Capitol while the U.S. Army Band, “Pershing’s Own,” played the hymns, "Fairest Lord Jesus" and "A Mighty Fortress is Our God." The Bush family and members of Bush's cabinet solemnly followed the casket into the Capitol Rotunda led by Maj. Gen. Michael L. Howard. Bush's casket was draped with the American flag and placed underneath the marble dome of the Rotunda. Surrounded by family, members of his administration, the current White House, Supreme Court justices and members of Congress, Vice President Mike Pence, Senate Majority Leader Mitch McConnell and Speaker of the House Paul Ryan paid tribute to Bush. "Thirty years ago, on the west front of this capitol, George Herbert Walker Bush addressed the nation for the first time as our president," McConnell said in his tribute on the rotunda floor. "He said, 'We meet on democracy's front porch. A good place to talk as neighbors and as friends.' The words of a humble servant who loved his fellow citizens and of a principled leader who knew America not only guards our own future but also safeguards democracy for the world. Today, this hero has returned to the capitol a final time." During his tribute, Ryan said he campaigned for Bush in high school. "He was the first president I had the chance to vote for. And he was the first president to teach me and many of us that in a democracy, sometimes you fall short. And that how you handle that, that is just as important as how you win," Ryan said. The remarks paid tribute to a man known for his kindness and humility. "When President George H.W. Bush left office, he left America and the world more peaceful, prosperous and secure," Pence said. "He was a great leader who made a great difference in the life of this nation. But he also was a good man who was devoted to his wife, his family and his friends." Pence shared a personal story of Bush writing to his son after he earned his Wings of Gold and made his first tailhook landing as a Marine aviator on the aircraft carrier USS George H.W. Bush. "I asked him to sign a picture of the flight deck that I could give to my son. We were told by the staff that the president had long since ended the practice of signing autographs and we understood that. But little to my surprise, just in time for my son's winging, there came not only a signed photograph but, of course, a letter. Hand-signed as well," Pence said. "In that letter President Bush wrote to my son, 'Congratulations on receiving your wings of gold. I know how proud you and your family are at this moment.' And then in words that assured us that the letter came directly from him, he wrote, 'Though we have not met, I share the pride your father has for you during this momentous occasion and I wish you many C.A.V.U. days ahead. All the best, G. Bush,'" Pence said. C.A.V.U. stands for clear skies and visibility unlimited and was one of Bush's favorite terms from his time in the Navy. "Ceiling and visibility unlimited. That may well describe the essence of this man," Pence said. "And it may well have been his vision. The vision he had for his life, for his children, his children's children and his country. No barriers, no boundaries, no limits." The plane -- referred to as Air Force One when the president is on board -- was given the name "Special Air Mission 41" on Monday and Wednesday for when the late president and his family traveled between Joint Base Andrews and Houston. When the plane landed at Andrews Monday under clear skies, it marked the start of a four-day tribute in the nation's capital to the 41st president. A hearse waited as the plane taxied to its place. (Alex Brandon/Pool via Reuters) Family members watch as the flag-draped casket of former U.S. President George H.W. Bush is carried by a joint services military honor guard during an arrival ceremony, at Andrews Air Force Base, Md., Dec. 3, 2018. Members of the CIA, for which Bush once served as director, and sailors from the carrier USS George H.W. Bush stood at attention. 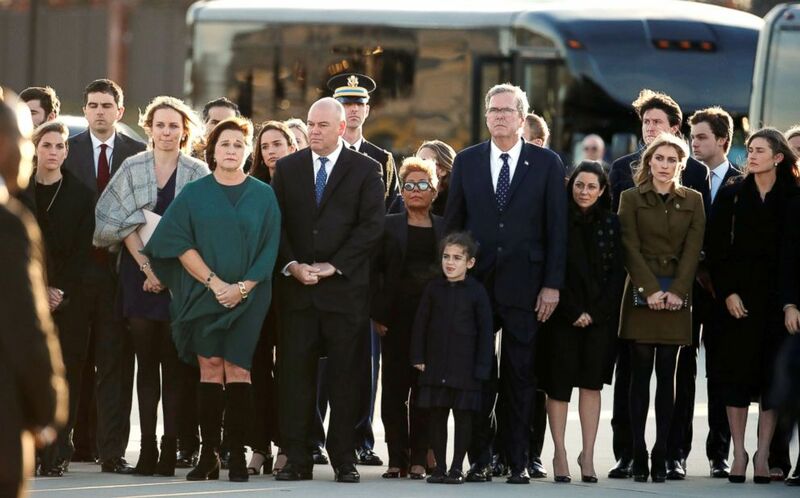 More than a dozen members of the Bush family descended from the Boeing 747 and then watched as military members carried the casket through a cordon and placed it in the hearse. The late president's longtime friend, former chief of staff and Secretary of State James Baker accompanied the Bush family, as did Sully, the 2-year-old service dog that stayed by the president's side through the last few months of his life. (Eric Gay/AP) The flag-draped casket of former President George H.W. Bush is carried by a joint services military honor guard to Special Air Mission 41 at Ellington Field during a departure ceremony in Houston, Dec. 3, 2018. As during the departure ceremony at Ellington Field Joint Reserve Base in Houston, the former president and World War II Navy pilot was honored with a 21-gun salute. After the ceremony, the hearse left for the U.S. Capitol Rotunda, where Navy captains and admirals will serve as pallbearers and bring the late president's casket up the Capitol steps. 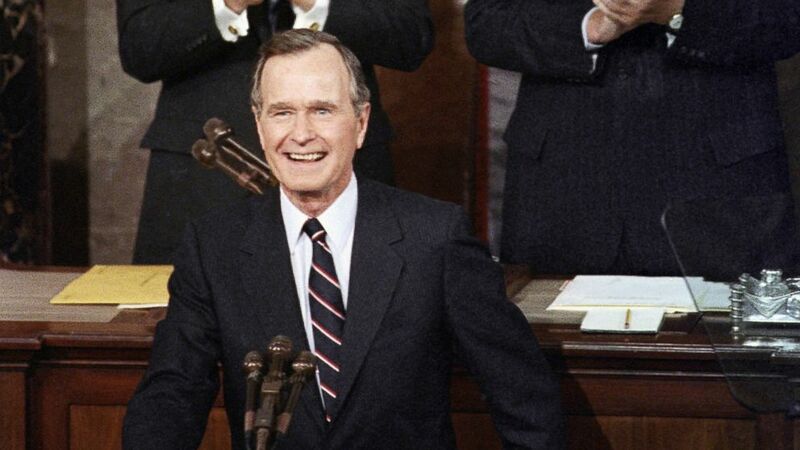 (AP) In this Jan. 31, 1990, file photo, President George H.W. Bush receives applause prior to delivering his first State of the Union address on Capitol Hill in Washington. 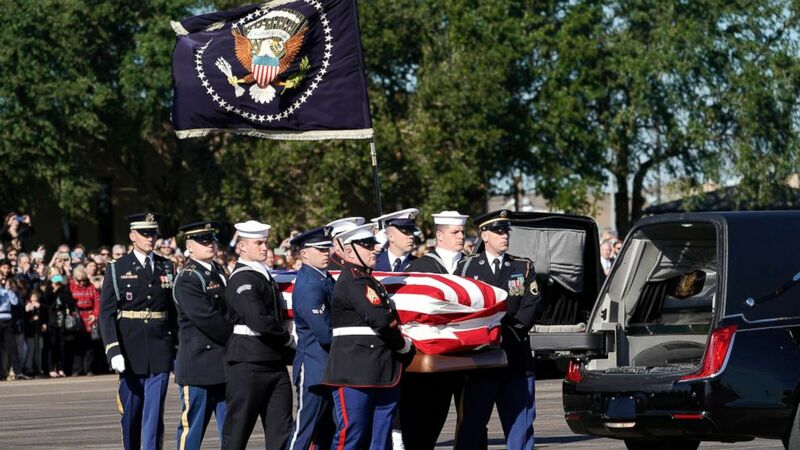 The official ceremonies honoring the late president began Monday morning as his family watched members of the U.S. Secret Service carry his casket from a funeral chapel in Houston to a waiting hearse. The motorcade then headed to Ellington Field about 45 minutes away. Bush, who was famous for having socks for every occasion, will be buried in a pair that pays tribute to his time in the Navy, according to family spokesperson Jim McGrath. The former president flew 58 combat missions in the Pacific as a torpedo bomber pilot and was shot down by the Japanese in 1944. Over the last few months, the Bush family shared photos of him wearing socks with former President Bill Clinton's face on them, as well as a pair featuring a yellow lab that looked like his service dog, Sully. (David J. Phillip/AP) The flag-draped casket of former President George H.W. Bush is carried by a joint services military honor guard in Houston, Dec. 3, 2018. As the departure ceremony was taking place, President Donald Trump tweeted that he would see the Bush family soon. 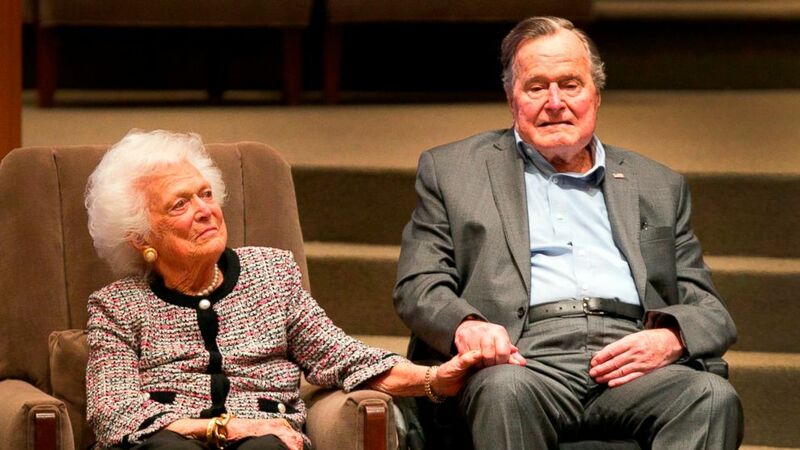 "Looking forward to being with the Bush Family to pay my respects to President George H.W. Bush," he wrote. The president doesn't yet have any public events scheduled with the family ahead of Wednesday's state funeral. Vice President Mike Pence is scheduled to make remarks at the U.S. Capitol, where the president's casket will be taken after an arrival ceremony at Joint Base Andrews in Maryland. The Clintons and the Obamas are expected to attend the funeral service, as well as former President Jimmy Carter. At age 94, the same age at which Bush died, Carter is now the oldest living president. The official schedule for ceremonies honoring the late George H.W. Bush was released on Saturday. The four-day tribute includes lying in state at the U.S. Capitol for parts of three days, a funeral at the Washington National Cathedral and eventual burial at the George Bush Presidential Library and Museum back in Texas. Bush's casket will lie in state through Wednesday morning. An honor guard will be in attendance and the public will be allowed into the Capitol from 7:30 p.m. Monday until 8:45 a.m. Wednesday. Sen. John McCain, a war hero like Bush, is the last person to lie in state at the Capitol following his death in August. Bush called McCain "a patriot of the highest order" following his death. The funeral at the Washington National Cathedral, set to be attended by a wide array of former presidents and politicians, including Trump, will last 90 minutes. Following the funeral, Bush's casket will return to Joint Base Andrews at 1:15 p.m. for the flight back to Houston. His arrival at Ellington Field is expected at 4:30 p.m. Central time on Wednesday. Bush will then lie in repose at St. Martin's Episcopal Church in Houston, where first lady Barbara Bush's funeral was held in April. The president's casket will depart by railroad on Thursday at 12:30 p.m. Central time and arrive at Texas A&M University in College Station, home to the George Bush Presidential Library and Museum, at 3:45 p.m. Bush, an admirer of trains, has had a special one with a glass viewing car designed to carry his remains to internment.